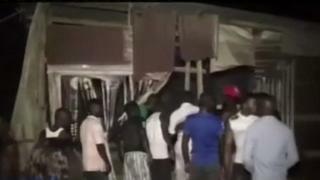 At least seven people have died after an electric cable fell on fans watching a Manchester United match on TV in Nigeria, police say. The high-tension cable fell on a crowded shack showing the Europa League quarter-final against Anderlecht in the southern city of Calabar. At least 30 people were taken to hospital by local ambulances and police who arrived quickly at the scene. Eyewitnesses describe hearing a loud explosion from an electrical transformer which caused the cable to fall. One man told local media that the venue had a roof made out of zinc, which transferred the electricity to those inside. An eyewitness told the BBC he had counted at least 16 bodies at the scene of the accident. It has been reported that scores of fans managed to escape. Manchester United has responded by tweeting its condolences to the victims and their families. Nigerian President Muhammadu Buhari has also sent his condolences. A statement from State House said Mr Buhari was "shocked and saddened" to learn of the tragic event. The death of "the mostly young victims" the statement adds, "is a big blow not only to their families, but also to the football-loving nation".